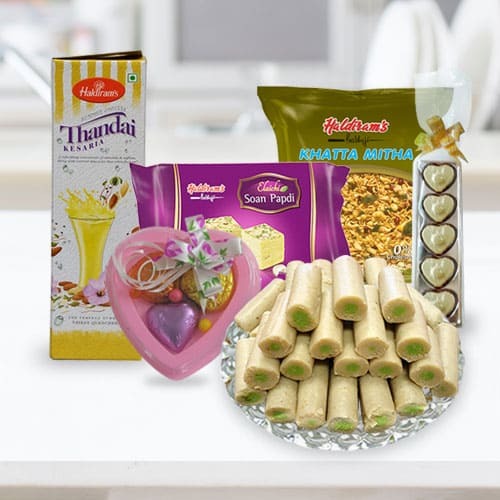 Elect this Haldirams Grace-of-Gratification Collection as a sweetened souvenir of your heart-felt wishes on a noteworthy success of a near one of yours and narrow down a bit more the proximity between you two. This Collection contains 250 gm Haldirams Soan Papdi (Gross Weight), 250 gm Haldirams Khatta Meetha Mixture (Gross Weight), 250 gm Haldirams Kaju Pista Roll (Gross Weight), 750 gm Haldirams Thandai Bottle (Gross Weight), 5 pcs Homemade Chocolates and 3 pcs Homemade Chocolates in a Heart Shaped Box. Flowers Delivery Jodhpur, Send sweets Muzzafarnagar, Wedding Cake Muzzafarnagar, Diwali Mithai Jalna, Send Flowers and Gifts to Bhopal, Online Shop Kolahpur, Flower to Firozpur, New Year Flowers Jalgaon , Fresh Fruits Kakinada, Send Gift Madanapalle, Dry Fruits to Durg, Birthday Delivery Buldhana, Sending to Warangal, Flower shop Kolhapur, Nizamabad Online Cake Delivery.